Happy Friday! It's going to be a beautiful weekend here in Central Florida. I love this time of year. However, for those of you in the north, particularly the Northeast, this weekend could bring some trying weather. My son lives in Boston so he will be keeping us apprised of the weather-related events in that area. Stay safe! 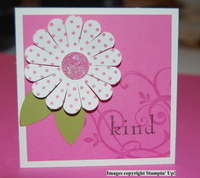 My monthly stamp camps met this week and a couple of our projects focused on Valentine's Day. We made a card and a little sweet treat to accompany it. Both projects used the paper from the More Amore designer series paper pack creating a nice coordinated look. See that awesome die-cut heart? That, too, is in the More Amore paper pack. Two awesome 12x12 sheets of heart die cuts in two colors. What really made this card come together was the Heart a Flutter Bundle. The stamp set along with the coordinating Hearts a Flutter Framelits made this card a snap to put together. And, who can resist the small fabric flower? 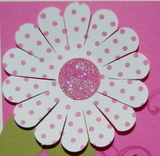 This flower comes on a strip of tulle making it easy to use one or several. And, for only $6.95 you receive 6 feet of flowers!! That is one serious strip of flowers! No need to be stingy with this embellishment! Inspired from a fellow demonstrator, Melissa Stout, we also made a matchbook valentine filled with a bit of chocolate. These were a hit. In fact, I made several more to hand out to the girls at my dental office. Something so simple can have a great impact. 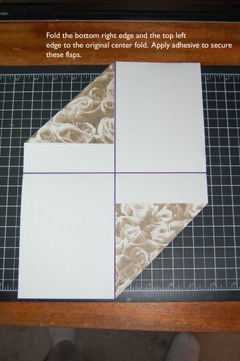 Cut a piece of card stock 2-3/4" x 8-1/2"
Score along the 8-1/2" edge at 3/4", 4-1/2" and 5"
Crease all score lines and fold card stock to create a "matchbook". Inspired by a swap I received from Paula Reuben at convention, the ladies in my Clermont Stamp Club recently made a mini notebook with a pocket. I had several packs of mini note pads in my drawer from a previous project a long time ago. What a perfect time to use up some supplies! 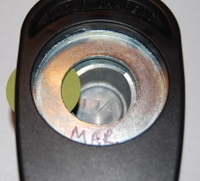 The completed project measures 3-3/4" x 5-1/2". It's the perfect size for a purse or even in the glove compartment of the car. The inside even boasts a side pocket to store your notes! 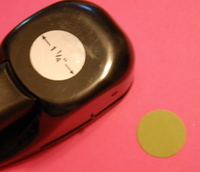 The notepads measure 3-1/2" x 5-1/4". I've had these awhile, but I probably found them at Walmart. They came three to a pack and were very inexpensive. 8 x 8-1/2" piece of card stock. Score along the 8" edge at 2.5". Score along the 8-1/2" edge at: 3-1/2", 3-3/4", 7-1/2" and 7-3/4"
Once you have scored, you will cut away the small rectangle created by the score lines where the pocket and the flap meet. This is simply to remove bulk and to create a clean pocket. Decorate the front as desired. Do you like this set as much as I do? You can order it here in my online store. Cut a piece of card stock 4.25" x 11"
Score at 3" and 8"
Cut a piece of Designer Series Paper (DSP) 1.25" x 11"
Cut a piece of coordinating card stock 1.325" x 11"
Embellish as you desire! 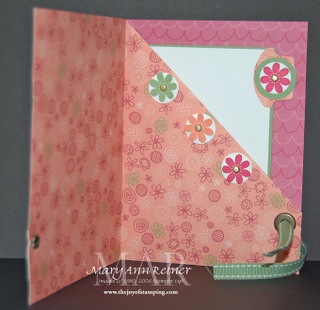 The inside envelope is the Scallop Envelope Big Shot die. I left the flap open so the folded money fits in it with no problem. Happy birthday to those of you who are celebrating this month! This candy holder is perfect to make with Stampin' Up! designer series paper because it is double sided and both prints are visible. Cut your paper to 7" x 10.5". Score at 3.5" and 7" along the long side of the paper. I told you it was easy! If you have any questions, please contact me. Welcome to part 4 of my Ain't Love Grand series. Today's card makes me chuckle - I think it is so stinkin' cute. This card is called a spinner card because it really does spin and move! I have been a Stampin' Up! demonstrator a long time (since 2002) and I can recall making a spinner card in my early years. I was so fascinated by this "technique" I made quite a few of these. Several years have gone by since I made my last one and I have to admit - it was a lot of fun to make this type of card again! This is very easy to assemble. Here's how: 1) Place a dimensional on the image (in this case the 1 1/4" blue circle). 2) Place a penny on that dimensional 3) Add another dimensional on top of that penny then stack another penny on top of that. So, you end up with two dimensionals and two pennies. I hope you enjoyed today's very brief tutorial. This type of card can have such a "wow" factor. Let me know if this tutorial helped you or if you have any questions. ﻿Stamps: Ain't Love Grand (new hostess set); Ink: Bashful Blue, Black and various markers; Paper: Bashful Blue and Whisper White; Accessories: Word Window punch, 2 3/8" scalloped punch (this is what I used to create the clouds), sponge, 1 1/4 circle punch, silver brad, dimensional, and pennies (2). 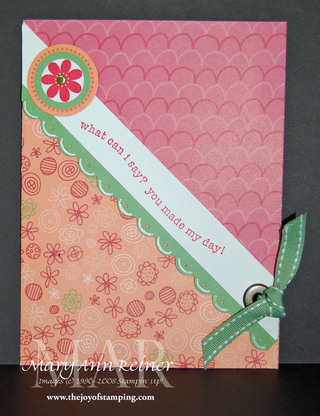 A Stampin' friend of mine (Hi Tami!) recently introduced me to the circle card case. It's such a cute card and holder - it's perfect to attach to a gift or even just to send a special message to someone in the mail. It's similar to the carousel note holder that has been floating around on various sites and blogs, but ultimately different. Take a look. The finished size of the card holder is 3 x 4 1/8 and the insert is 2 5/8 x 4 These are very simple and quick to make and can be made to accommodate different size cards/inserts. 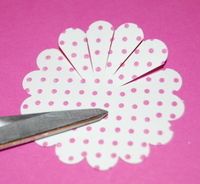 After your circle is cut out, fold up the bottom of the circle so that it is approximately 3/4" from the top. Adhere double stick tape (Sticky Strip works best) on the bottom of each flap. Fold each flap toward the center. *NOTE: I punched three holes along the right flap before adhering it to the center. These holes will hold my ribbon. Inserting the ribbon at this point is easiest. Once the ribbon is inserted I added a small piece of adhesive just to the left of the ribbon so it will help the flap lay flat. Once both sides have been folded toward the center you're done! Embellish as desired. Thanks for stopping by. Have a great Wednesday. I'm in the process of preparing for next month's Stamp Camp and was playing with a couple of different card folds. I pulled this one out of the archives and updated it a bit with some current designer series paper. 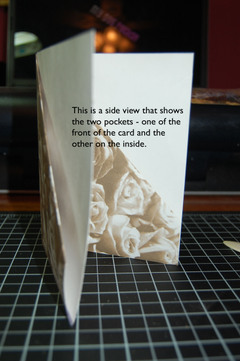 This is a double pocket fold, but different than the one I did in December (seen here - scroll down to Dec 17th). Today's card actually opens like a traditional card whereas the previous pocket card had both pockets on the front and did not open. I don't have anything in the front pocket in the sample only because I enjoy the contrast of the designer paper. As you will see in the next photo, I did put an insert in the pocket inside. I have two jumbo brads positioned approximately 1" from the bottom for ribbon to tie it shut. These really aren't necessary because the card stays shut on it's own, but I added it, well...just because I could. Cut your paper to 9 x 12. Fold the bottom edge up to the top (then unfold) and then fold in half left to right (then unfold). 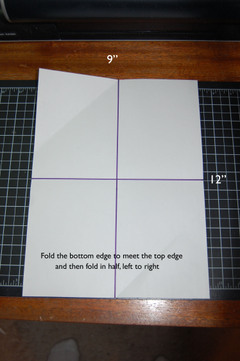 As shown in the diagram, fold the bottom right edge to the center fold line and do the same for the top left edge. Use adhesive to secure these corners down. 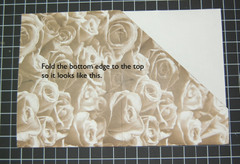 Fold bottom edge to the top edge (no adhesive). To complete the card, fold the left side to the right. Here is what the card looks like from the side. Embellish as desired. Have fun with this. Let me know how yours turns out! One of my favorite commercials is the "Eat More Chiken" campaign by Chick-Fil-A. Those cows totally crack me up! I couldn't help but think of those cows when I was assembling today's project. 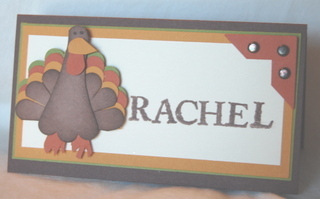 With Turkey Day arriving tomorrow, I am in the midst of making place cards for each place setting. 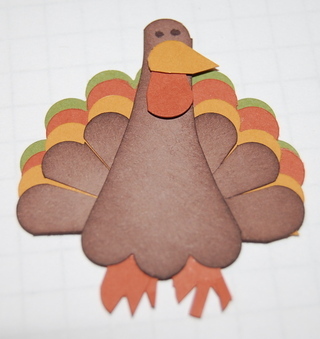 Isn't this turkey cute?? A big "thanks" to my fellow demonstrator, Carol Taggart, for sharing this adorable bird. 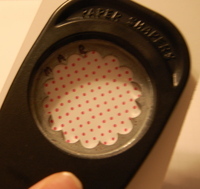 Here's the best part - this guy was made completely using ONE punch - the scalloped circle punch - honestly! 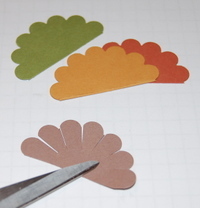 Punch out a number of scalloped circles in various colors then cut them in half. 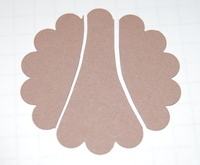 On the brown piece, take scissors and cut towards the center to make the feathers. 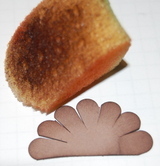 After forming the feathers, take an inked sponge along the edges to give it some definition. For the eyes, I just added a touch of a black marker. There you have it! A cute addition to your Thanksgiving table. 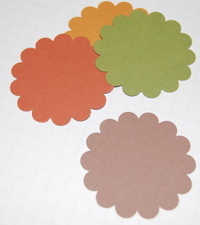 With paper snips, cut from the edge of the scalloped edge to the center to form a "flower"
Take a circle punch (any size will do - it just depends on the size petal you are wanting). I used the 1 1/4" circle punch for my 3x3 gift card. Do you see it? Isn't that cool? To form the other petal, simply reinsert the remaining part of the circle and punch again. Now it's time to assemble the flower. Assemble your card and get ready for the "ooh's and ahh's"